There was a mission room in this part of the parish of St John, which was considered to be too far away from the church, by 1887. This was the mission church dedicated to St Alban in the parish of St John that is mentioned in KD 1899. In fact, one year previously a second hand iron church had been built on a different site and dedicated to St Andrew. Plans for a permanent building soon followed and a start was made in 1903. This was consecrated in 1908 (BN 95 p818) before completion. The architect was L W Ridge (GRI), who here surpassed his usual standard. He built in a simplified gothic, using brick, with mostly trefoiled lancets. The aisleless interior is spanned by a broad roof, rising from buttresses that divide the side-walls into bays. Though there are transepts, they do not impinge on the interior, as there are no arches into the nave. Unusually, the nave was built first and when consecrated the planned tower and chancel were lacking. In the continued absence of the former, the exterior has an oddly unecclesiastical look. Judging by the tall arch into the present chancel, Ridge intended one of equal or at least proportionate height. The small arches each side, now containing windows, show it would have been aisled. However, when work resumed in 1924, a lower sanctuary was added as a war memorial (VCH 7 p179). Its roof has a lower pitch and the upper east wall of the nave was filled with more lancets and flanked by pepperpot-turrets. The chancel roof is panelled. The fittings, including a wooden reredos, contrast with the plain nave. 1. (South nave) Kempe and Co, 1909. 2. 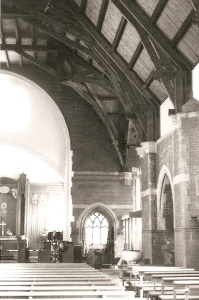 (Lancets over chancel arch) F C Eden, 1924 (DSGW 1930). 3. (South transept east window) L Ginnett of Ditchling, 1934 (WSRO Fac). 4. (West window – north light) G Maile and Son, 1941 (WSRO Fac).